Recently I worked with a team of fellow creatives on an “Ice Queen” character concept and photoshoot. Since snow is in pretty short supply in sunny Florida, to create the snow-covered photo set we envisioned required much brainstorming, research and experimentation. While we could have resorted to a more Photoshop based approach and created the snow effects on the computer, we wanted to get as much of the winter effect in camera in one shot as possible. Filmmakers have long grappled with this issue and provided some very creative solutions. Examples include specially formulated firecrackers that create falling white ash, piles of instant mashed potato flakes or finely shredded paper. With fake snow, there’s usually no one solution, and it completely depends on the type of snow you are trying to create. Snow covered branches, a big snowy field or soft fluffy drifts? In this scene, we wanted all three of these effects, here is how each was created, including materials, techniques and tips specific to each. White drop cloths, found in the paint department. Generally, you’ll want to avoid the canvas ones as they have an obvious cloth texture and a yellow hue. The cheap disposable ones I found there were much closer to pure white with little fabric texture. Footstool or other small platform for the model to stand on. Tape or clamps to hold the cloths over the edge of the tub. The challenge here was to create a realistic effect where the model looked like she was standing in the snow. With most fake snow solutions you end up standing on top of it, not sinking into it. The bathtub created the illusion that the model was knee-deep in the white stuff without having to have tons of artificial snow. The tub also can be used to hold and hide other items, like a fog machine or lights, both of which were used in this shot. 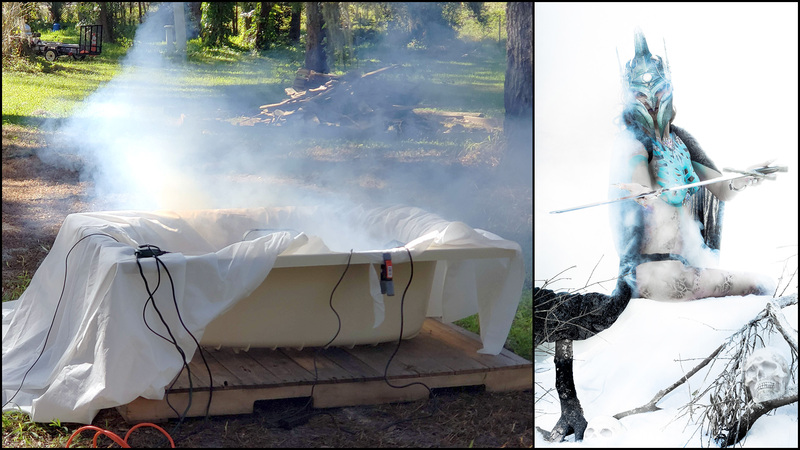 I cut off a piece of a pallet to set in the tub to get the right height for Andrea, which also gave her some room to move around as well as support the fog machine and a LED light panel. We placed the tub on a hard surface and braced it thoroughly so it wouldn’t rock or tip over (I used pieces of scrap wood for this). Next place a crumpled tarp, paper or other large items in front of the tub to break up its outline and create a gentle slope in front of it. Cover the front edge of the tub with a drop cloth that runs over the crumpled tarp. Secure it to the inside of the tub using gaffer tape or clamps so it doesn’t slip during the shoot. Blend this in with the “snowy field,” below, as the foreground. The edge of the tub had a distinct straight line, something you wouldn’t see in most snowscapes. Subtly introducing rolls and changes in height broke up this outline, creating a more realistic effect. See how Andrea’s legs disappear into the “snow?” The tub plus a little fog create a nice illusion of depth to the drift. Large tarp or other items you can wad up into a big irregular shaped ball. Random dead branches or other props, using the “icy branches” effect below. Lay the tarp out over the area you will be shooting. Crumple it up in spots — the goal here is to make it irregular, making certain that it is not completely flat. This creates rises and falls, much like a real field. When you place the drop cloths over it, they follow these forms, but gently, so you have soft smooth peaks and valleys throughout your snow scene as you’d find would in nature. Add extra items poking through the snow. Push these through the drop cloth layer so it looks like they are coming from under the snow. Take about five parts Spackle to one part water and mix it together in a container. The consistency should be thick enough it doesn’t run or drip, but thin enough it applies easily with a light brush stroke. This may take a little experimenting to get right, so have something like scrap wood to test it on first. Use a big soft paintbrush, like a four-inch wide one you would use for exterior painting. In a pinch, you can also use a big sponge or a ball of paper towels. Dip it in your “Spackle snow,” and then gently brush it over the surface you want to make snowy. Use a light touch, it’s better to apply multiple coats and allow drying time between each, than to try to glob it on in one thick coat. Remember, snow sits on the top of things, not the bottom. When applying your Spackle snow, apply from the top down. Brushing the undersides of things will immediately kill the realism. Mix this snow effect with others to get the effect you want. Hot glue from a glue gun can produce remarkably realistic icicles and ice effects. Use coarse sea salt before the Spackle has dried to add more texture. Just shake the salt over your scene. The fun thing about this is there’s no one right way to do it; you can devise many creative options to make similar effects. Truly the best results we created were when combining multiple effects and layering them from foreground to background in the scene. When you want to add more sparkle to your scene, the first instinct for most people will be to grab the glitter. Stop and realize that glitter is horrible nasty stuff. Once you bring glitter into your home or studio, you will have glitter on everything and yourself forever. It’s like a disease that never goes away. Beyond the plague like problem of spreading glitter, it’s also terrible for the environment. Although glitter has been around for a long time, it was previously made from more natural materials. Most modern glitter is made of plastic. It’s made from fossil fuels and does not biodegrade. Its small size makes it easily passed into and up the food chain, especially in marine environments where filter feeders ingest the stuff, and it then gets passed on from predator to prey. Like all microplastics, it can build up to toxic levels, and wreck an ecosystem. Look for biodegradable options, generally made from plant cellulose, like this: https://shopuniversalsoul.com/pages/whyisglitterbadfortheenvironment or this https://goodglitter.com/blogs/news/5-things-to-know-about-glitter-1. While the snow scene sets the mood for the “Ice Queen” series, it wouldn’t have been possible without the talent of model Andrea Romano Meythaler, body painting and effects by the extremely creative Starr Silara, and awesome props like the ice helm created by fabricator Sterling Hayden.